CMS Made Simple uses a simple group-based permissions model. This means that permissions are assigned to groups instead of individual users. Users then inherit the permissions of the groups they belong to. Any member of the Admin group, or another group that has the Manage Users and Manage Groups permissions, can make changes to any group’s permissions. Admin users can also add and delete users and groups. You can add as many CMSMS users as you need and assign each user to one or more groups. Users can also be disabled or deleted. To add a user, go to User Management > Backend Users. On the Profile tab, add the user Name and Password and ensure that Active is selected. First Name, Last Name, and Email Address are optional. Click Backend Groups and assign the user to one or more existing groups. Click Settings. If you want to copy another user’s settings and preferences to this user, select the user from the dropdown list. This is helpful when the new user is replacing or performing the same tasks as an existing user. Click Submit. Admin – The Admin group is automatically granted all permissions. Editor – The Editor group has permission to manage content, news, and their own user settings. Designer – The Designer group has permission to manage content, designs, templates, files, user-defined tags, and their own user settings. A user can belong to one or more groups or no groups at all. Users that belong to multiple groups have the most permissive permissions of the groups they belong to. For example, the Designer group has permission to add templates and the Editor group does not have permission to add templates. If a user belongs to both the Designer group and the Editor group, that user does have permission to add templates because of the membership in the Designer group. You can test a user’s permissions by going to Backend Users and clicking Test as this user next to the user name. In the CMSMS admin panel, Backend Group Assignments is where you can assign users to groups. To add a user to a group, go to User Management > Backend Group Assignments. In Select Group, select All Groups or the specific group you want to view or change. Select the check boxes to assign the users to groups and click Submit to save your changes. Backend Group Permissions is where you specify which permissions are assigned to each group. To specify group permissions, go to User Management > Backend Group Permissions. In Select Group, select All Groups or the specific group you want to view or change. Select the check boxes to assign the permissions to the groups and click Submit to save your changes. 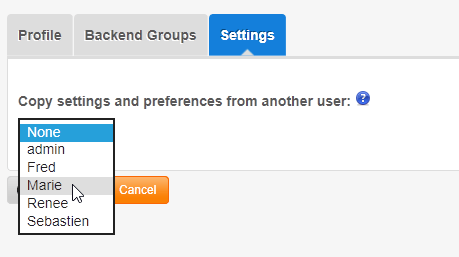 You can add, delete, or deactivate groups in User Management > Backend Groups. To add a group, click Add New Group. Enter a Name and Description for the group. In this example, we’re adding a group called Contributor. Ensure that Active is selected and click Submit. New groups don’t have any permissions until you explicitly assign them. Click the key icon to open Backend Group Permissions and follow the steps for assigning group permissions. After you have assigned permissions to the group, click the user icon to open Backend Group Assignments and assign users to the group. To edit an existing group, click the edit icon. 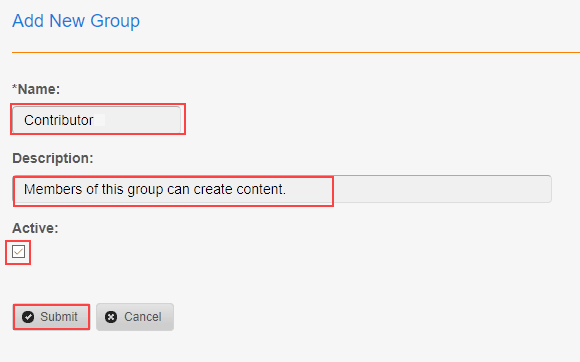 You can change the group name, description, or deactivate the group. To delete a group, click the delete icon. When you delete a group, the users in the group are not deleted. If a user’s only group is deleted, the user will be able to log in to the admin panel, but won’t have permission to perform any tasks.